>Sunday was bright and cold. Time for my first event of the year: The Team Quest reliability trial. I haven’t ridden on the road for several weeks, so I decided to ride the short route (73km). With the ride to the HQ and back I would clock up just over 55 miles for the day. We started at 9:30 – after the groups riding the full 100km+ course had set out. There were about a dozen of us to start with and we kept it together until about half way (Marlow). I did a bit of work on the front. This was especially valuable on the climb of Winter Hill where I could slip back gracefully and still be in touch by the summit. The route back was pretty good apart from the climb of Kiln Lane. I’m afraid that I bailed out early and walked (I have a dread of stalling and not being able to unclip my feet on a climb – this dread is based on bitter experience). I think I was still third over the summit. The last few miles were enlivened by being caught by a couple of faster riders. That hurt a bit. We finished the 73km in about 2:50 to 2:55. 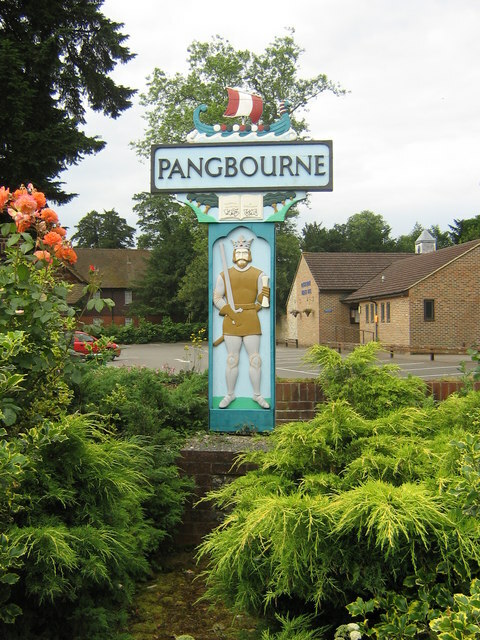 It was a well-organised event with an HQ (great refreshments before and afterwards), free gifts and a well-signposted, carefully thought out route. The season has begun. > Saturday to Calshot with Andy H of the Westerley CC (cheers for the lift, Andy) for the penultimate Prime Coaching session of the Winter. Keith and Tony were the coaches and Aileen registered the riders and co-ordinated the timing. 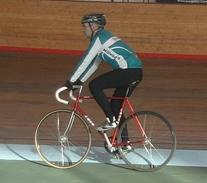 This was my first ride on my new second hand track bike (left) – I just managed to get it built in time. It handled well, but I need to check the position again (sore knees). 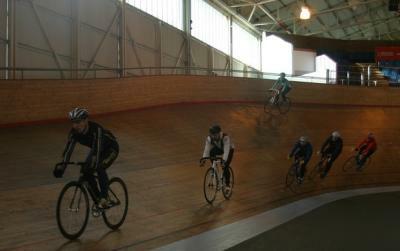 A smaller group than normal meant that we had plenty of track time – that is: plenty of time to get frazzled. 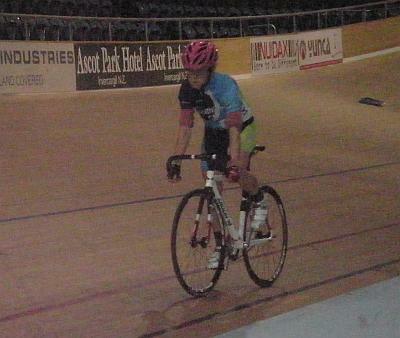 We went through a whole series of exercises including a timed flying lap. I ‘flew’ to a 12.06sec lap. Andy did it in 11.51sec, so I got a lift home. I bottled out of the last Madison exercise – maybe next time. The photos are all by Tony using Andy’s camera. 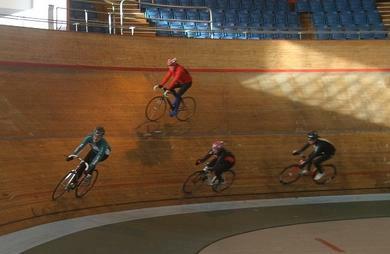 Sunday was the Willesden CC reliability trial. The day started with heavy rain. A lot of riders thought better of starting. 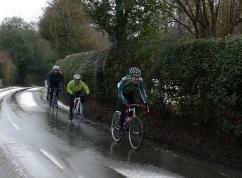 Though the downpour stopped quite quickly the roads were wet throughout and drenched the riders. As we climbed to Wendover Woods the wetness turned to slush and then to snow. I’d been thinking of turning short at Wendover anyway, and these conditions looked like a good excuse (especially after the experience of the Team Quest reliability). Five of us (including fellow WCC members Rich and Richie) headed back along the A413 and Denham to the HQ at Ickenham where the low number of participants meant there was plenty of tea and cake to be had. I should feel guilty about cutting the ride short (plenty didn’t), but I don’t. The photos are by organiser John. He had hoped to ride but understandably didn’t want to risk injuring his hair style in the damp conditions. >The Edgware reliability is the flattest of the Chiltern Classic series. I like it. Today’s event took place on a messy day – starting in flurries of snow and then persistent drizzle through the day. This made the roads very messy. Naturally several people (self included) decided to take out their non-mudguard bikes. I started with the slow group (4-4.5 hours for nearly 100km) and we started at a sensible pace (all on the 39 ring). I even managed to do some turns. At about half way there is the only steepish hill (Honey Lane?) on the course. The effort increased and the gaps opened. I started the hill slowly, but kept going and had the lead bunch in sight over the top. I clicked across to the 53 ring and started chasing. Groups formed and split for the next 30 minutes or so before a working group coalesced and the effort needed dropped. I was well pooped. The ride to the finish was a bit up and down in pace (not so down that I could do a decent turn) but we still kept it going to finish in 3h 30m for the course. Not many of the later starting fast group caught us, so it was a good ride (about 75 miles door to door). I was so covered in road dirt that a customer at the finish cafe asked me if I’d fallen in a ditch. Oh for a camera. Thanks to the Edgware RC for organising the event (and using it to raise funds for the Alzheimers Society). I opted for the 90km route on Quest’s reliability trial (trying to avoid hills again). It has the great benefit of going up the long, gradual Hughendon Valley climb which suits a heavy diesel like me. I still managed to get dropped towards the top though. We were slower this year. We had several extended icy sections to traverse and this year we worked hard (i.e. waited) to keep the 10 strong group together for the whole ride. I’m rather grateful – I struggled after yesterday’s effort. My little brother bought me Cycling Past 50 by Joe Friel for Christmas. He can be hurtful sometimes. I haven’t opened it yet but I’m looking forward to the chapters on Carbo-Loading With Werther’s Originals, Fitting SPD Cleats to Slippers and Which Oakleys Go Best With YourMeerschaum Pipe? Thanks, Gary.